Mustapha AKRIM (b. 1981, lives and works in Rabat and Sale). His installations question the nature of work and the difference between construction and creating art in light of society’s state of constant change. 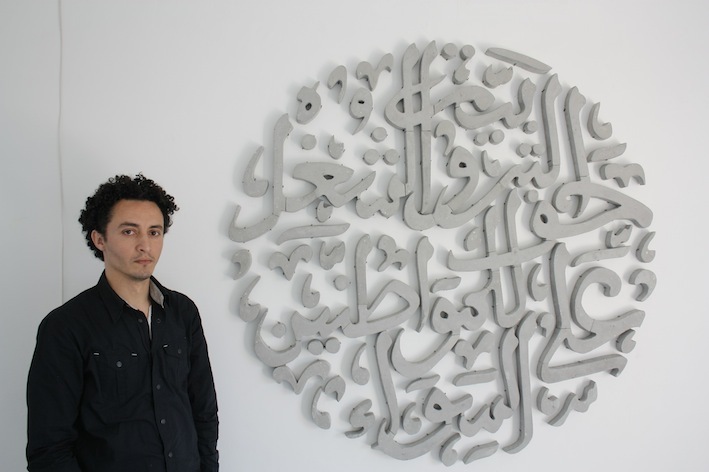 He graduated from the Institut National des Beaux-Arts de Tétouan in 2008. He showed at L’appartement 22 and at the 3rd Biennale of Marrakech at Palais Bahia, and remarked in it as his first exhibition in a museum in Morocco. Akrim has participated in workshops in Namibia, Jordan, France, and Morocco, and has also been in residence at L’appartement 22 in Rabat. 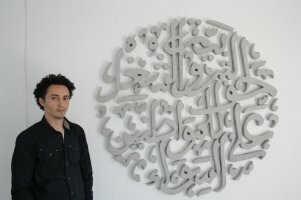 He is part of a generation of artists that is developing a new language with which to redefine the basis of expression in the visual arts in Morocco (Generation 00). With a nuanced understanding of history and the dynamics of power, this generation searches for a new freedom in its break from the aesthetics developed in the immediate post-colonial period and after. In 2011 L’appartement 22 organized "Article 13", his first solo exhibition. Memory - Sequential Movement, La maison des cultures Maroco-Flamande, Brussels, 2018. JF_JH egalites, L’appartement 22, Rabat, 2017. Rif Post-Residencies/Expeditions, L’appartement 22, Rabat, 2014. Here and Elsewhere, New Museum, New York, 2014. JF_JH Libertés, L’appartement 22, Rabat, 2012. Surveillé(e)s, La Halle de Pont-en-Royan, 2011. Working For Change, 54th Venice Biennale, 2011. A Proposal for Articulating Works and Places, AiM International Biennale, Curated by Abdellah Karroum, Marrakech, 2009. JF_JH egalites, L’appartement 22, Rabat, 2016-2017.